This peel and stick wallpaper was the perfect addition to the sides of our vintage dresser drawers for our coffee station. I love the pops of color we added to our boring dresser drawers with peel and stick wallpaper. If you’re craving more color, consider adding peel and stick wallpaper to the sides of drawers ! You guys…I love my coffee station. Not only is it one of the more sacred spots of our house (because…you know…#coffee), but it’s extremely functional and pretty cute. There was nothing wrong with our coffee bar per se….but do you know when you have one of the home projects that you finish and it still feels like it is missing something?? It wasn’t obvious when I revealed our coffee station a few weeks ago. But, I think our coffee bar was missing the infusion of character and color that I try to put into everything in our home. It was wonderful, but it needed to be a little more me. Enter…..peel and stick wallpaper. This stuff is amazing. 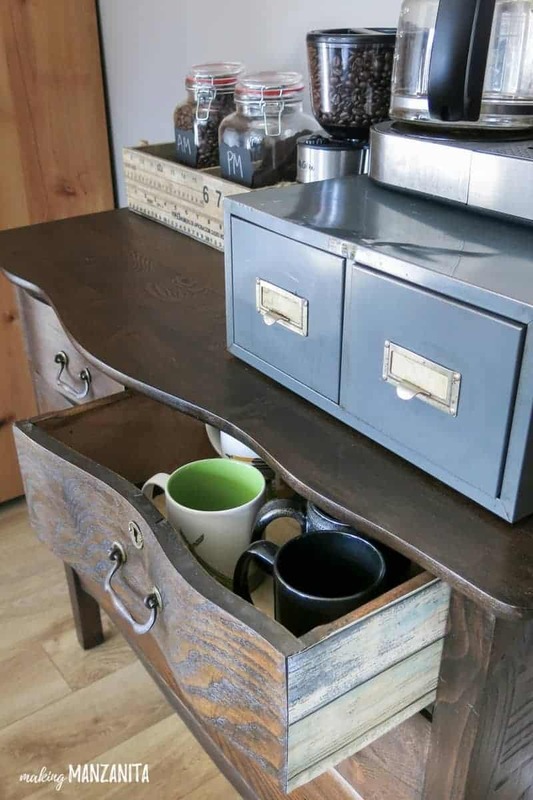 It adds just amount of color and extra texture to the coffee station. 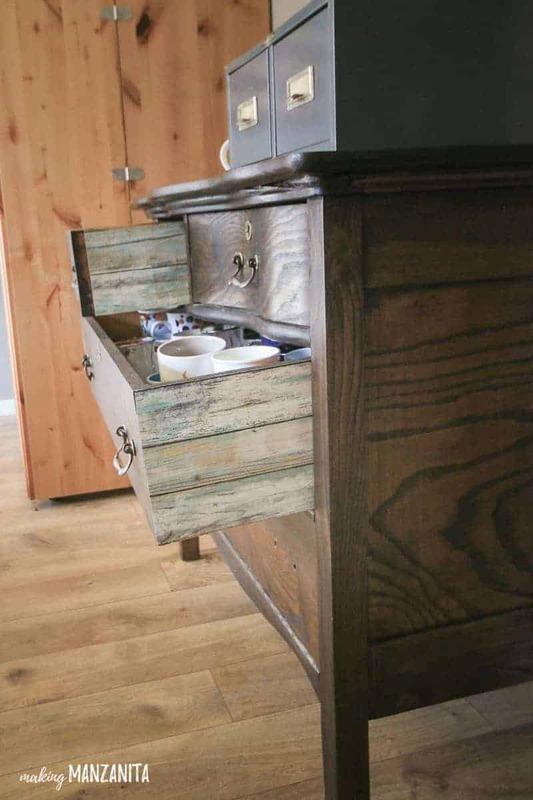 I love that the vintage dresser we use for our coffee station remains in its classic style with the refinished dark coat of stain, but we were able add pops of color by applying the peel and stick wallpaper to the sides of drawers. They are only visible when you pull the drawers out. It’s a fun and unexpected detail that really is the missing piece of the puzzle for our coffee station. Step 1. Trace drawer on back of wallpaper. Remove the drawer from the dresser. If your drawer has tracks, you will either want to work around the tracks (like placing the wallpaper above the tracks) or remove the tracks before tracing. Put the drawer on its side and trace all the way around the drawer on the backside of the peel and stick wallpaper. If anything include a little bit of overhang, you can trim it off later. Step 2. Cut out drawer shape on the wallpaper. I just used scissors (P.S. these scissors are amazing!) to cut out the shape of the drawer on the wallpaper. 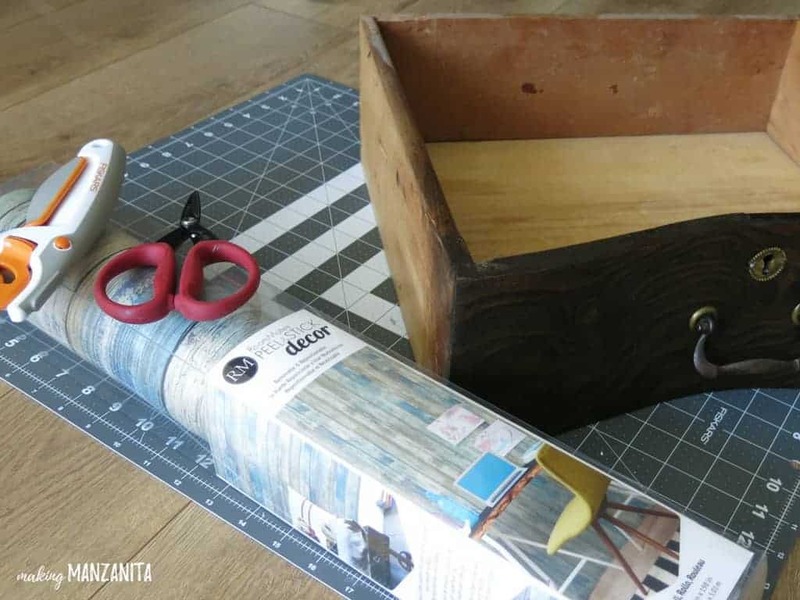 If anything, you want the paper to be a little larger than the drawer because you can always trim off the extra later. Step 3. 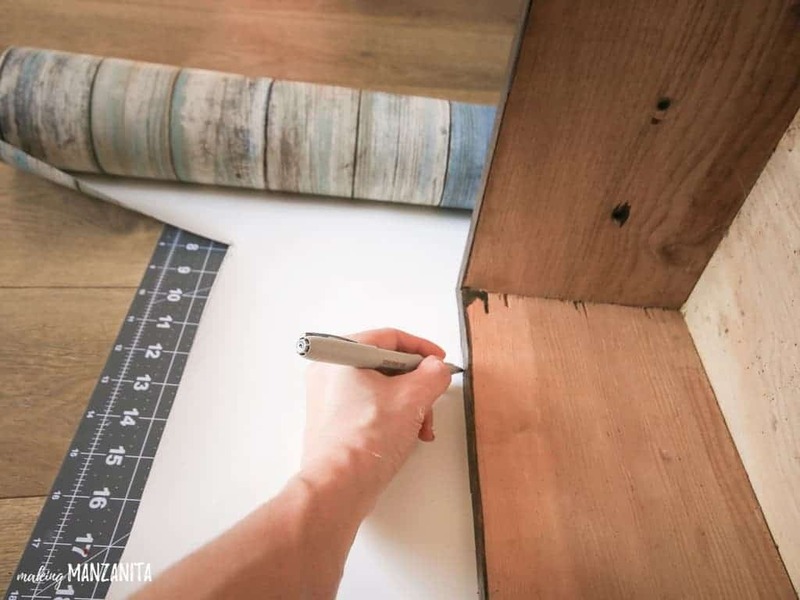 Apply the peel and stick wallpaper to the sides of drawers. The best part about using this peel and stick wallpaper on the sides of the drawers is that it is completely repositionable. So, if you don’t get it on straight the first time, no big deal. You can peel it up easily and straighten it up. Step 4. Trim off excess. 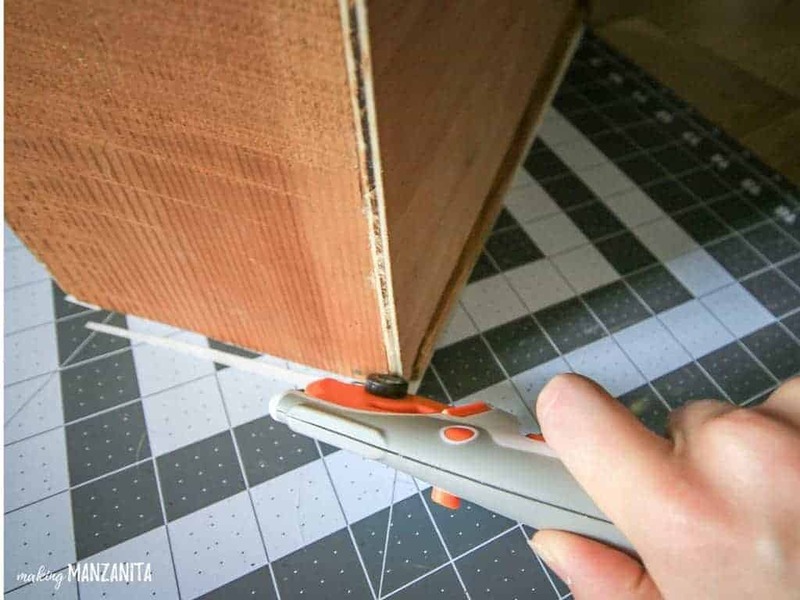 Using the rotary cutter, trim off the edges of the peel and stick wallpaper where it hangs over the edge of the drawer. 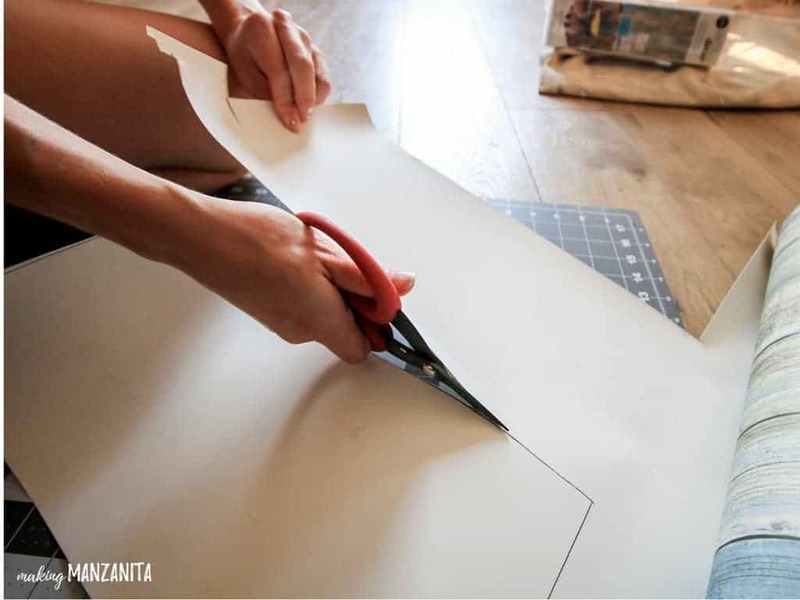 Be sure that you do this on a cutting mat so you don’t scratch the surface below. Step 5. Add tracks back onto drawer (if applicable). If you removed tracks on your drawer earlier, be sure to add the back onto the drawer! Step 6. Slide door back in and smile! Simply slide the drawer back in your dresser! What do you think? Do you love the pops of color that are added by the simple addition of the peel and stick wallpaper to the sides of drawers? The project couldn’t be any easier. 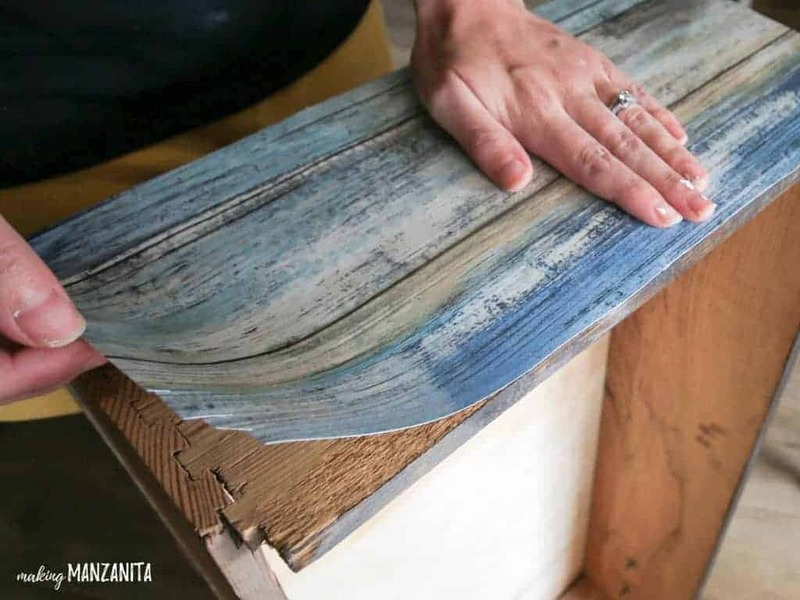 All you need to do is grab some peel and stick wallpaper and add it to the sides of your drawers and you’ll have instant color and personality. 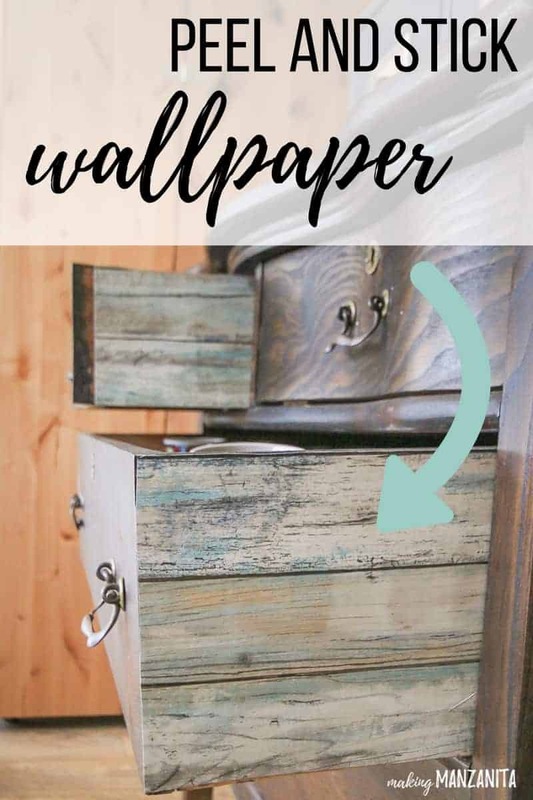 I think the best part of this DIY is that you can totally customize it because they are SO MANY different kinds of wall paper out there, so you can choose whatever matches your mood or your decor! 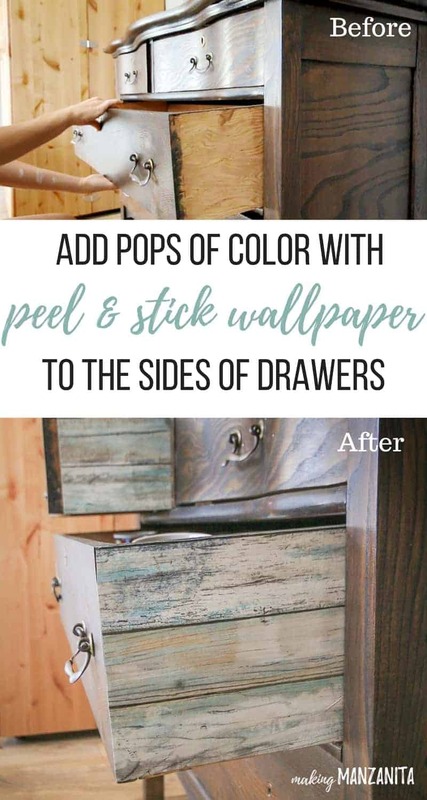 Add pops of color with Peel and Stick Wallpaper to the sides of drawers! So, now it’s your turn! What pattern or color wallpaper would you choose for the sides of your dresser drawers? P.S. There was tons of wallpaper left over from this project, so let me know what if you have any good DIY ideas with peel and stick wallpaper! Looks great but I’m wondering how it’s holding up. A lot of the comments on Amazon indicate that this wallpaper loses it’s tackiness after a few months and falls off the wall. Have you had any problems with the wallpaper? Hi Cleo! I did this project just a few months ago, but so far the wallpaper is holding up great on the sides of our drawers. What a fantastic idea. I love the pattern you chose. DI’d not know such design existed.